Keep in mind that the most important factor in PvP success is you. If you’re really serious about PvP you’ll know your character inside out and you’ll know the other guy’s character inside out, as well. You’ll know what he’s likely to do and what you can do about that. This page is just an overview of Paladins in PvP. See the individual pages below for more in-depth detail. Holy Paladin PvP – Superb healers and very hard to kill. 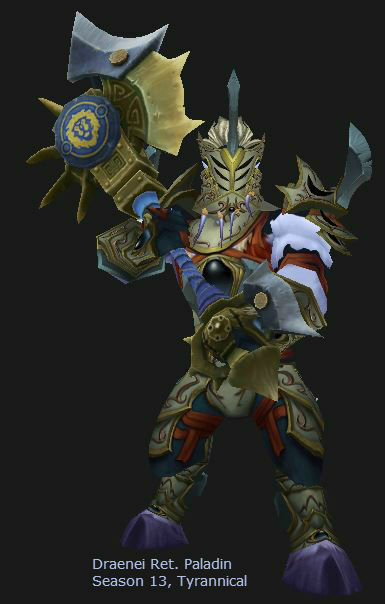 Holy Paladin PvP Gear – Just the gear, please. Paladin leveling – if you’re not yet max level. Paladin overview – A top level view of the Paladin, in general. The value of Resilience was crushed in patch 5.3. Now everyone in any gear starts at 65% resilience. Yes, if you hop into the arena in raid gear you have 65% resilience. You won’t have any PvP Power, though. See here for how it works in patch 5.3. PvP Power and Relience gem values were cut in half in patch 5.3, so now only have 160 points each, where they had 320 before the patch. In addition, PvP Power was nerfed by a third and Resilience was changed: it no longer appears on most gear and every starts with 65% Res. as a base value, regardless of gear. Enchants are similar: Int/Str > then the secondaries. Don’t bother gemming or enchanting for Resilience. Meta socket: Revitalizing Primal Diamond until you can get Tyrannical Primal Diamond. The legendary Courageous Primal Diamond is a pretty nice choice if you can get it. If you can use your keys for all of your abilities and your mouse to turn (and not click abilities) then you’re ahead of the game. Impulse will make it easy for you to set up all your keybinds and macros. Get yours here.